George Bowles trained first as a philosopher (BA, University of Denver, 1966; PhD, Stanford University, 1970) and taught philosophy for over twenty years, publishing several articles on logic in refereed journals. Having drawn and painted from childhood, and having done several commissioned portraits, animal paintings, and landscapes, he studied painting and drawing at the Bougie Studio in Minneapolis (1996-2000), producing in the course of his study numerous charcoal and pencil drawings, still lifes, portraits, landscapes, and figure paintings. He has exhibited his work at the Abbott Gallery, McLean; Byrne Gallery, Middleburg; Fisher Art Gallery and the Art League Gallery, Alexandria; Fraser Gallery, Bethesda; JarrettThor Fine arts, Colonial Beach, and Metropolitan Gallery, Arlington; as well as Sothebys.com (via Fraser Gallery). His portraits "Adriana" and "Antonios" and his still life "Balloon Lady" were finalists in The Artist's Magazine 2001, 2006, and 2008 Art Competitions, from a competitive field of between 11,000 and 13,000. And on the strength of his still life "Oblique Encounters" he was Artist of the Month at the same publication's Web site April 6-May 6, 2005. His still life "checkered Cascade" won first place in two independently judged shows: "East Meets West," sponsored by the Arlington Artists' Alliance, and the 2009 Potomac River Regional Art Show, Colonial Beach, Virginia, at which latter show his "Silver Pitcher, Grapes, and Wooden Dish" also won the People's Choice award. 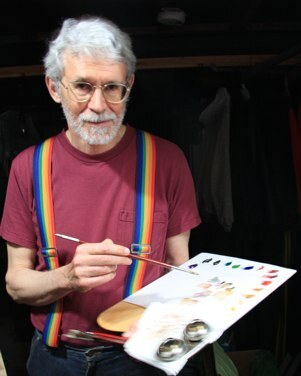 Later, his "Balloon Man" was one of ten winners in the "Over Sixty" national competition sponsored by , resulting in the painting and a brief interview with the artist appearing in the March 2010 issue of the magazine. In 2010 "Balloon Man" won first place at the Potomac River Regional Art Show. In 2011 "Kristin" won first place at the Potomac River Regional Art Show.